Steak for breakfast, lunch and dinner? 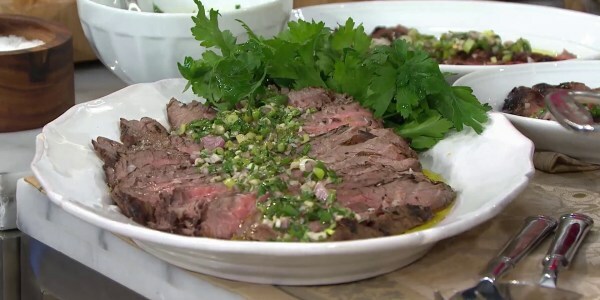 Anything is possible for Food Network star and Chef/Partner of Point Royal at Diplomat Beach Resort, Geoffrey Zakarian, who stopped by Megyn Kelly TODAY to demonstrate three ways to serve up his favorite flank steak recipe. He stresses the importance of taking the time to let the meat marinate and rest before throwing it on the grill to ensure tender results. And his green onion chimichurri is so versatile that it can be used for many proteins — fish, meat, poultry or even tofu. After a steak dinner, take your leftovers and add potatoes, bacon and eggs for a breakfast hash that pack a delicious punch of flavor. Still craving steak for lunch? A flank steak sandwich will fix that. Homemade pickles and a horseradish cream sauce are details that take this sandwich to a new level. Flank steak is a versatile protein when cooked to perfection — and served with the perfect sauce. Leftover flank steak makes a great breakfast with the addition of potatoes, bacon and eggs. 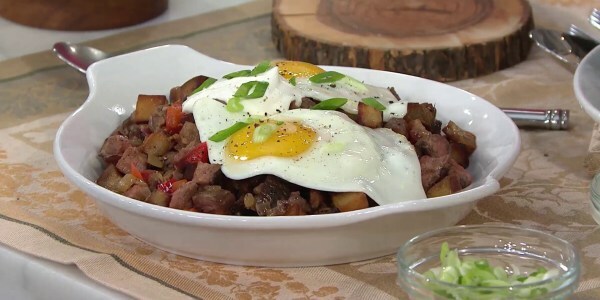 The hash is an American classic and pairs well for dinner or breakfast by adding an egg. Steak sandwiches are a great way to serve up leftover flank steak for lunch. Go the extra mile for a spectacular sandwich with homemade pickles and a horseradish cream sauce which balance nicely.